The word ‘bitter’ has decidedly negative connotations; it tells of an unpleasant experience, a lingering memory perhaps, or a bad feeling. Bitterness is first and foremost a taste but it also translates and is superimposed onto a person’s psychological or emotional state. There are many popular sayings in Italian and English that attest to the negative taste and feelings of bitterness: for example, “restare con l’amaro in bocca”, which means to leave a bitter taste in ones mouth after a bad experience. The taste of bitterness takes on an emotive representation. The Italian relationship with the taste of bitterness shifted starting from the late nineteenth century, when bitters, known as amari, went from being medication to becoming a popular drink. Before dinner these drinks are known as the aperitivo, and post-dinner, the digestivo—meant to help with appetite and digestion. Although some of the original healthful aspects of the digestivo and aperitivo still remain in these categories of drinks, pleasure and sociability are the dominant motivations and associations in their current consumption. How is it that the consumption of bitter drinks in Italy, amari, originally associated with illness and bodily discomfort, has come to take on a positive connotation associated with leisure and pleasure? How did amari make the move from the pharmacy to the bar? Bitter is one of the five basic tastes. However, it is often given a bad rap, and for good reason. Humans abhor anything bitter because this taste is often a sign of toxicity. Plant-derived alkaloids and glycosides and other environmental toxins tend to have a bitter taste. It seems logical that being able to identify and reject bitter compounds might therefore have a certain evolutionary advantage meant to protect humans from poisoning themselves. Babies are most sensitive to bitter tastes since only a small amount of a toxic substance can be fatal. As we age, we lose taste buds and with them, our ability to perceive bitterness. This partially explains why bitterness becomes more attractive to adults — some adults might not be able to fathom life without bitter stimulants such as coffee and chocolate. At the same time, biological reactions to bitterness do no explain how the use of bitter drinks as medicine changed to bring about pleasure. The taste of bitterness has long been associated with medicines that local healers, apothecaries and later, pharmacists, concocted using extracts from bitter-tasting plants, spices and alcohol. These medicines were used to treat a variety of ailments but the main purpose of amari was to aid digestion. Recent scientific research has shown an association between bitter compounds and appetite stimulation through the activation of bitter taste receptors in the gut. The consumption of bitter raises the hunger hormone called α-ghrelin, which encourages food intake. Before this research, pharmacists and local healers were convinced that bitter plants had these properties. Bitter substances were used to balance the bodily humors in numerous medicinal systems. Different forms of medicinal bitter drinks can be found throughout Europe. The ingredients of amari can vary greatly but almost all have a base of alcohol distilled from grapes. The bitter element of amaro can be derived from plants such as cinchona, wormwood, gentian, angelica, cardoon or artichoke and citrus peel, to name a few possibilities. Spices and aromatic herbs are also common ingredients: anise, fennel, ginger, licorice, cardamom, saffron and mint. To balance the bitterness in amari, a sugar syrup is added. After the macerated mixture is filtered, most amari are aged in wood casks. There is a great number of amari available throughout the Italian peninsula and these draughts have long been part of local medicinal practices as a digestive aid. Their preparation and ingredients more closely resemble a culinary process, which is often in evidence with folk medicine. 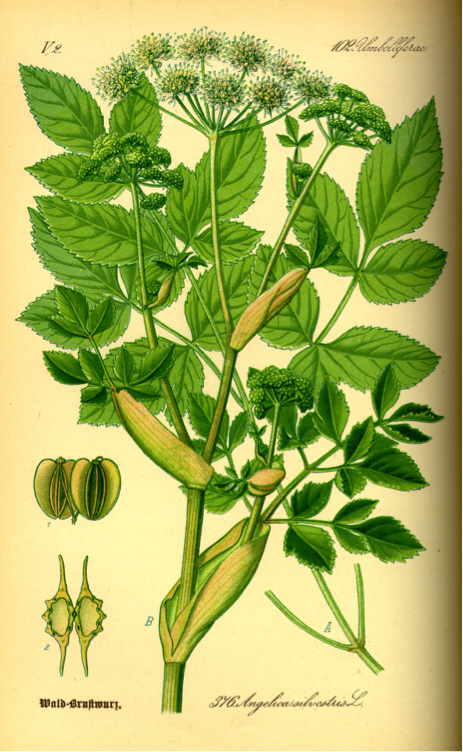 Wild Angelica (Angelica sylvestris) from Thomé, Flora von Deutschland, Österreich und der Schweiz 1885. Wikimedia Commons. Originally, amari were concocted in private homes by local healers, monks and later in pharmacies. The nineteenth century saw the rise of the Italian middle class and the increasing professionalization of medicine and pharmacy. During this period, home cures, midwives and other ‘non-scientific’, ‘un-modern’ forms of healing and medicine were gradually pushed to the margins by ‘scientific’ knowledge and Italian healthcare and the body slowly became the domain of health professionals. Each pharmacist had their own secret recipe for making their distinctive digestivo, which was inevitably a taste combination of bitter smoothed over with a good dose of sugar. Some of these beverages became very famous for their healing properties and their exceptional taste. In addition to pharmacists, northern Italian entrepreneurs began to concoct and market amari. The first marketing campaigns in the mid-nineteenth century were focused on health and the medicinal properties of these bitters but this soon shifted to focus on wellbeing and lifestyle by the first decades of the twentieth century. Initially digestivi were always consumed after meals to aid digestion. However, in the late nineteenth century, this began to change when the practice of having an aperitivo to stimulate, or literally ‘open’, the appetite became popular amongst the middle classes. Amari, along with vermouth and other fortified wines, blended with spices and herbs were common aperitivi. In his 1907 book about vermouth di Torino, the enologist Arnaldo Strucchi talks about the beneficial properties of this drink: “Consumed in small doses, it has a beneficial influence on the body. With its tonic properties it stimulates the appetite and has a fortifying effect on weak stomachs.” These appetite-stimulating liqueurs were frequently bitter and sweet—not so different from digestivi. In nineteenth-century bar culture, aperitivo liqueurs were often mixed with seltzer water and ice, a luxury in this era because of the general rarity of ice in warmer seasons and due to the expense of the equipment to sparkle water. Both the aperitivo and the digestivo became part of a social drinks culture before World War I. The rise of the social aspects of medical practices amongst the burgeoning middle classes presented new forms of sociability and opportunities for class identification in Western Europe at the end of the nineteenth century. Douglas P. Mackaman’s book Leisure Settings on medicine and spa culture in fin-de-siècle France provides an example of how medical treatments became partially transformed into social and cultural practices. In a similar manner, the consumption of medicinal drinks in Italy took on new cultural meanings of sociability, as beverages like amari moved from the pharmacy to the bar. The rise of café and bar culture is very important to this social and gustatory shift, before middle-class social life was centered around the home. In Italy, like in France, at the end of the nineteenth-century new spaces of sociability such as galleries, boulevards, cafés and bars were becoming increasingly present and popular in Milan, Turin, Florence and Rome. These were spaces in which men and women could socialize, and where the middle classes came to display their social status. Along with these new places and forms of social life came new types of drinks to facilitate specific social moments. The aperitivo fitted the social function of a pre-dinner drink and it also had a medical purpose that facilitated and justified its consumption. Bitter and sweet alcoholic beverages stimulated delicate appetites, along with conversation. The cultural meaning of the bitter taste of medicine and preoccupations of health began to transform into a taste that invigorated social life, not only the wellbeing of the body. The aperitivo and the digestivo, once marked a time for taking medicine and addressing the negative effects of eating, became moments of leisure and sociability in the new semi-public spaces of cities. The case of Fernet-Branca demonstrates this shift from private medicinal functions of amari to their social consumption for pleasure. In 1845, Bernardino Branca and his wife Marina Scala created a recipe for an amaro that they claimed had anti-cholera properties, beneficial to digestion and good health more generally. Based in Milan, Branca was an innovator who developed new techniques for extracting the essence from plants. In the tradition of the Italian amaro, Branca’s recipe is still a secret today. Fernet-Branca claims their amaro is made of 27 plants from four continents. The exoticism of the ingredients (Iranian saffron, myrrh and Aloe from South Africa to name a few) certainly had an appeal for upper and middle-class Italians who were fascinated by Italy’s imperial ambitions in North Africa. 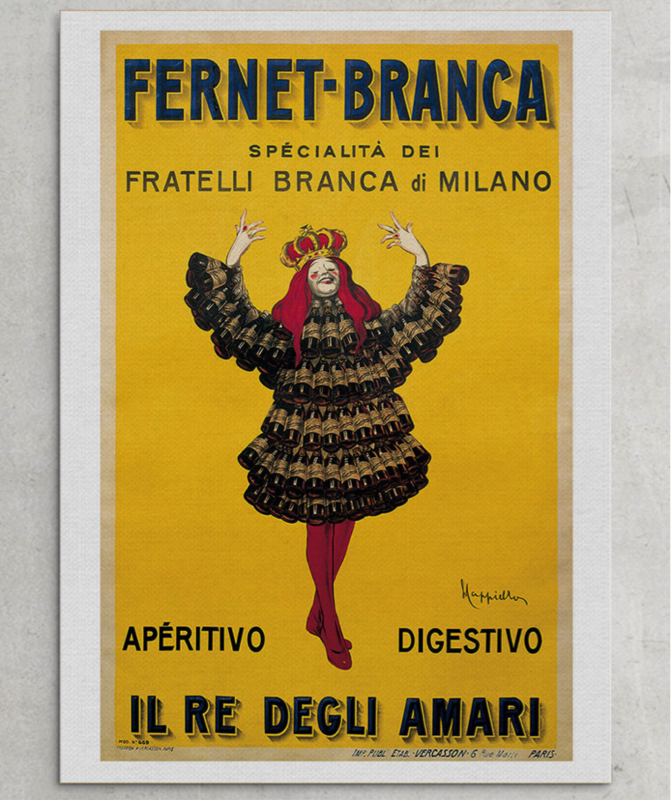 In the 1900s, advertising materials embraced the ‘exoticism’ of Fernet-Branca’s ingredients. At the same time, Branca’s amaro is part of a tradition of amari based on the extracts of local plants such as chamomile. Fernet Branca advertisement from the Almanacco del Fanfulla, 1875. Courtesy of Collezione Branca. The company also commissioned the renowned poster artist, Leonetto da Cappiello, to design some of their most successful poster campaigns. By the 1920s, poster adverts had made a commercial claim to the visual landscape of most European cities. French and Italian aperitivo and digestivo producers created some of the most striking images that brought attention to their brands and made their products household names. Fernet Branca poster by Leonetto da Cappiello. 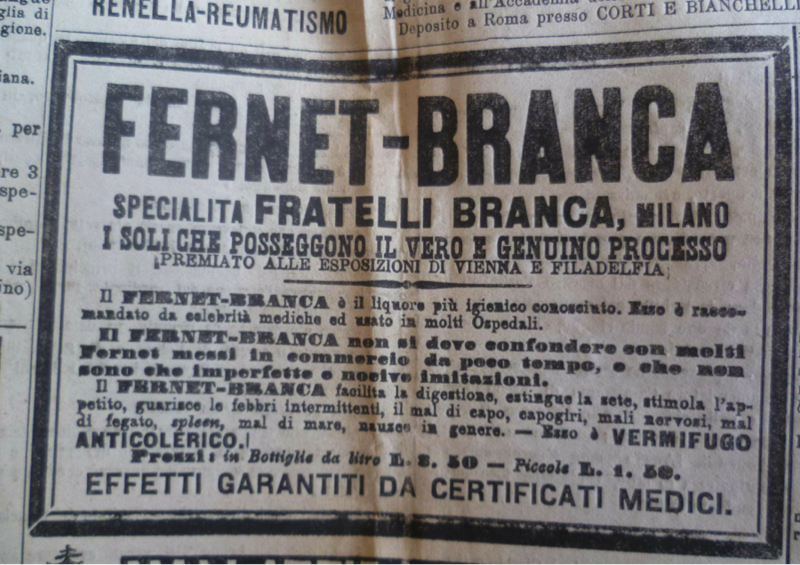 “Fernet –Branca: The King of Amari”. Courtesy of Collezione Branca. Fernet-Branca was one of the most successful amari as far as sales and marketing were concerned. In addition to newspaper and poster campaigns, Fernet-Branca incorporated their name and icon into bar signs. This branding of the public space encouraged patrons to consume products that before had been secluded to a very specific time, place and function for consumption. Advertising played an important role in changing the meaning and use of these drinks. In early campaigns the health properties of these beverages were advertised but by the early twentieth century, images dominated and the product became associated with places such as colonial territories, real and fictitious people, large public events, such as the world’s fair, and feelings of happiness and joy. Drinks for the aperitivo and digestivo were now more part of the social and pleasurable aspect of dining and social drinking experiences. Fernet-Branca is just one example of an Italian amaro that began as a bitter health elixir and then was transformed into a beverage consumed for health but also, and particularly, for pleasure. The taking of bitter drinks before and after meals at the turn of the twentieth century indicates changing norms surrounding the consumption of alcohol. With wine still the main beverage consumed along with meals in Italy, ‘healthful’ drinks before and after meals slowly became more socially-oriented. Nonetheless, alcohol consumption remained associated with eating and digestion—intoxication was taboo in Italy and would not have been admitted as the main reason for this middle-class drinking culture at the fin de siècle. The changing consumption of bitter drinks allows for an analysis of the changing meanings of bitterness, health and the social consumption of alcohol. In Italy, the consumption of amaro and the meanings of bitter drinks shifted to reflect new social and economic realities as the middle classes became increasingly affluent and as new spaces for consumption and sociability began to appear in cities and towns. In the case of amaro, the taste of bitterness and the word bitter lose much of their negative connotations. The word no longer represents a bad experience or illness; instead, amaro comes to connote a social moment and distinctive pleasure associated with the consumption of alcohol. At the same time, bitterness is a reminder of amari’s medicinal origins, and the healthful properties of these drinks linger on in Italy as an excuse and invitation to enjoy a drink before or after a meal. Rachel E. Black holds a PhD in Anthropology from the Universita degli Studi di Torino in Italy, and is author of Porta Palazzo: The Anthropology of an Italian Market (University of Pennsylvania Press, 2012). She is currently completing a year as a fellow at the Collegium de Lyon in France, where she is doing ethnographic research on women who cook professionally. Drewnowski, A, Taste preferences and food intake, Annual review of nutrition 1997, 17 (1), 237-253. Beauchamp, Gary K., and Julie A. Mennella, Early flavor learning and its impact on later feeding behavior, Journal of pediatric gastroenterology and nutrition 2009, 48: 25-30. Janssen, J. Laermans, P.J. Verhulst, T. Thijs, J. Tack, I. Depoortere, Bitter taste receptors and α-gustducin regulate the secretion of ghrelin with functional effects on food intake and gastric emptying Proc Natl Acad Sci, 2011, 108: 2094–2099. D. Bates, ed.. Knowledge and the scholarly medical traditions. Cambridge University Press, 1995. P. M. Guarrera and V. Savo, Perceived health properties of wild and cultivated food plants in local and popular traditions of Italy: A review, Journal of ethnopharmacology 2013, 146 (3): 659-680. Here folk medicine is defined as medicinal practices that are passed on through oral traditions that are usually practiced in domestic situations. Wild herbs are often a feature of folk remedies. G. Cosmacini. Storia della medicina e della sanità in Italia: dalla peste europea alla guerra mondiale, 1348-1918. Laterza, 1987. E. Fasoli, A. D’Amato, A. Citterio, P.G. Righetti, Anyone for an aperitif? Yes, but only a Braulio DOC with its certified preteome, Journal of Proteomics, 2012, 75 (11): 3374. Douglas P. Mackaman. Leisure settings: bourgeois culture, medicine, and the spa in modern France. University of Chicago Press, 1998. There is a great deal a literature about boulevard and café life at the end of the nineteenth-century in France but very little has been written about this phenomenon in Italy. However, in cities like Milan and Turin many of the same trends in urban planning and changes in the social uses of public and private spaces can be seen. Vanessa R. Schwartz Spectacular realities: Early mass culture in fin-de-siècle Paris. Univ of California Press, 1997 and Jerrold Seigel. Bohemian Paris: culture, politics, and the boundaries of bourgeois life, 1830-1930. JHU Press, 1999. The medicinal purpose of amari may have become secondary to most drinkers but the bitter taste reminded people of the previous function of these drinks and the medicinal aspect was never completely eclipsed. Nate Cavalieri, The Myth of Fernet: The saga of Fernet and its cult-like popularity says a lot about San Francisco, 2005 Dec. 7, http://www.sfweekly.com/sanfrancisco/the-myth-of-fernet/Content?oid=2158526&storyPage=3 accessed May 4, 2015. Fernet Branca, http://www.branca.it/FernetBranca/prodotti/ENG/M-METOP-M0003-P0001/, accessed June 18, 2015. Rachel Smith, A-Z of unusual ingredients: Fernet Branca, The Telegraph, Aug. 28, 2013, http://www.telegraph.co.uk/foodanddrink/10269051/A-Z-of-unusual-ingredients-Fernet-Branca.html accessed May 4, 2015. Very informative. My son and I were impressed. Pingback: Nibbles: CIAT job, Rice revolution, Pomegranate genebank, Spiderplant, Floating heritage, Lager origin, Amaro history, Golden Rice et al.